In his weekly email message to our principals, the deputy superintendent for our overly-large school district opened with this quote from Pasi Sahlberg, author of Finnish Lessons and keynote speaker at last week’s Leadership Conference. The true Finnish difference is that teachers in Finland may exercise their professional knowledge and judgment both widely and freely in their schools. They control curriculum, student assessment, school improvement and community involvement. Teachers here can’t control the curriculum. It is extremely prescribed, heavily scripted and, in most cases, laser focused on the state standardized tests. In many schools teachers don’t have much to say about assessment due to the growing clamor for data and a push to use the online testing system on which we’ve spent a lot of time and money to create “common assessments”. Some might be involved in school improvement but goals for those plans often come from district administration and offer schools very little flexibility. As for community involvement, that varies widely depending on many factors, most of which are not something over which teachers are allowed much influence. All of this is not to say that our schools couldn’t change to move closer to Sahlberg’s Finnish difference. In her Answer Sheet education blog at the Washington Post site, Valerie Strauss* tells Tom Friedman a few of the things he got wrong in a recent column about the importance of education. Starting with Arne Duncan’s big money game show, praised as energizing reform by Friedman. First of all, Race to the Top funding didn’t go to states with the most innovative reforms to achieve the highest standards. It went to the states that promised to make the reforms that the Education Department liked most. A comprehensive analysis of who won the money concluded that winners in the first round (and the same process was used in the second) were chosen through “arbitrary criteria” rather than through a scientific process. Besides, the “reforms” aren’t exactly innovative. Education historian Diane Ravitch has written that merit pay schemes have been tried repeatedly since the 1920s but never worked very well. And then there’s the matter of Finland and Denmark, the countries whose teachers and education systems Friedman (and others) write so glowingly about as a point of comparison with the US. But on that topic, he also manages to miss one glaring point of disparity. Friedman never mentions the issue of poverty, which today’s education “reformers” see as an excuse for poor teaching even though the research on what living in poverty does to children and their ability to learn is overwhelming. Finland, it should be noted, has a poverty rate among children of under 3 percent; the United States, 21 percent. Anybody who doesn’t think that doesn’t affect student academic performance in a big way is deluding themselves, as is anybody who thinks teachers alone can make up for the effects of hunger and violence and sleep deprivation and little early exposure to literacy. So, does anything Friedman says, right or wrong, in his column or on his appearances on the talking heads channels, really matter? Yes. Â Because many readers of the so-called “paper of record” take him seriously, and have the right to expect opinion/analysis based on research. In this case, Friedman didn’t do his homework. *Why doesn’t the Post retire Jay Mathews as their lead education writer and put Strauss in that position? The third port on our big trip was recently listed as one of the world’s most livable, and the country of Finland appeared on another rated as one of the world’s most peaceful. After our far too short visit, I completely understand both rankings. Â Helsinki seems to have a great positive energy to it, unlike the negative, even aggressive energy of many cities I’ve visited. People, even those dressed for business, were very friendly and never seemed to be in any particular hurry. Â On this sunny day, one our mid-Atlantic US-tuned bodies found a little chilly, people were out in parks and on the water enjoying a nice summer day. The shore excursion we selected was a little more bus ride than I would have liked but it give us a good overview of the city and the guide offered some wonderful insights to the history and culture of the area. On the down side, I didn’t take nearly as many pictures as in the other places we visited. Finland is very much tied to Sweden having been ruled by that country for 600 years until the Russians took over in 1809. Even today, both Swedish and Finnish are official languages with both being used for street signs and government documents. They are very wary of the Russians, however, both as a result of fighting the Soviet Union during World War II and tensions during the Cold War. Anyway, beyond seeing a part of the world new to us, one of the main reasons for taking this trip and for this particular itinerary is my wife’s love of Scandinavian music and design. 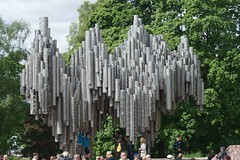 So, one of the stops on the tour paid homage to the Finnish national composer Jean Sebelius, a composer whose compositions she has performed many times. The picture above is the monument to him set in a very peaceful park. I’m probably repeating myself but, as with our previous two stops on the cruise, one day was not enough and this is definitely one more city I’d like to return to someday. But for this trip, we were off to our next stop, St. Petersburg, Russia.